Our goal at Waterbed Bargains is to provide high quality waterbeds, conditioners, heaters and accessories to our customers at an exceptional value. Despite all the best efforts, sometimes there can be a problem with an order. 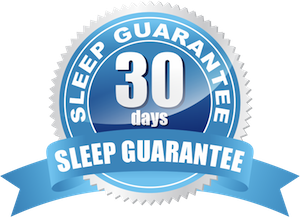 To make your shopping experience as trouble-free as possible we offer a 30-night sleep trial on any hardside waterbed. We do not pick up any products in the event of a return. You will be responsible to ship all merchandise in the original boxes to the correct warehouse within the time frame allowed. Any Waterbed Mattress Bundle Products including, conditioner, heaters, pads or liners. Can my softside or hardside waterbed be returned if I've put water in it and find it uncomfortable? All hardside waterbeds are covered by our 30-night in home trial. If you dislike the feel of the hardside waterbed, then you may return it for a store-credit to use for the purchase of a different waterbed mattress in accordance with the terms of our 30-night trial (below). The bladder / fluid chamber is exchangeable under the terms of our 30-night sleep guarantee. If you are not satisfied with your softside mattress then you may exchange the fluid chamber once for a different chamber. (In the event of an exchange, you are responsible for any price difference between your current fluid chamber and the new bladder.) We want you to be happy with the feel of your new softside waterbed mattress. Exchanging the bladder is the simplest way to dramatically alter the feel of the softside waterbed. You are eligible to exchange the bladder one time for a different bladder. You will be responsible for the shipping costs of the replacement bladder. If you do not wish to exchange the hardside waterbed you may return the hardside waterbed within the 30 days; your refund will be less the original shipping and handling that was incurred to ship you the bed. This will be deducted even if free shipping was indicated on your order. We can only pay for your shipping if you keep the bed. What are the terms of the 30 Night in-home trial? In order to give yourself time to adjust to the new hardside waterbed, you must sleep on it for a period of at least 21-nights. If, after this time you still find the bed uncomfortable, you may initiate a No-Hassle return anytime before the 30-night in-home trial ends. The 30-night trial begins on the date you receive you mattress. Only the hardside waterbed itself is eligible for return. Due to the costs of shipping, as well as health concerns, we are unable to accept the return of bed frames, foundations, heaters, water conditioners or any other accessories. Only the hardside water chamber itself may be returned for store credit exchanged. The terms if the 30-night in home trial may only be exercised once. This means you may exchange your bed once or return it, but you may not exchange the bed and then return the purchase. How do I contact you with questions about my purchase? You must contact us with the 30-day trial window or we will be unable to accept any returns. We will advise you on the proper shipping address when we begin to process your return. Please be sure to use tracking and insurance when you send your product back. You will be responsible in the event of a lost package. For this reason we ask that you send your package back to us by UPS or FEDEX - If you select to use the post office, you must purchase delivery confirmation. Purchase enough insurance to cover the value of your return. All international orders are final. We cannot offer returns, exchanges or warranty support on any international orders. We send the highest quality merchandise with attention to detail in every order, but we cannot be 100% sure that every product will work for your application. Take extra care when placing an international order and remember that all international orders are final. Placing an order through this site constitutes an acceptance of this return policy.